My neighbor Tom King, better known as W4VZH to his friends in the American Radio Relay League, has a cautionary tale to share about waiting to install an emergency generator. He had always planned to get an emergency generator, but with one thing and another, he was always busy helping others. When the last big storm hit, his house lost power and he went off to live with his relatives for a few days. The temperature dropped well below freezing in his fairly new home, but there didn’t seem to be any damage when he came back. Unfortunately his pipes had frozen and by the time the leak was spotted, the house had sustained enough damage to more than pay for a new generator. After the plumber and contractors left, Tom decided he would make sure this did not happen again. 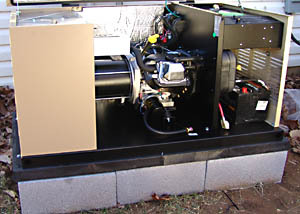 He ordered a 7 Kw Guardian Automatic Standby Generator that runs on Propane. This is the kind of generator that comes on automatically when power fails. 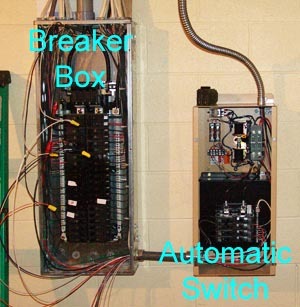 It protects 8 circuits of your home and the basic unit runs around $2000. The heart of the system is an automatic transfer switch which transfers certain circuits from utility power to generator power. That is the smaller box in the picture. The most important part of any emergency power system is figuring out which circuits will get emergency power. 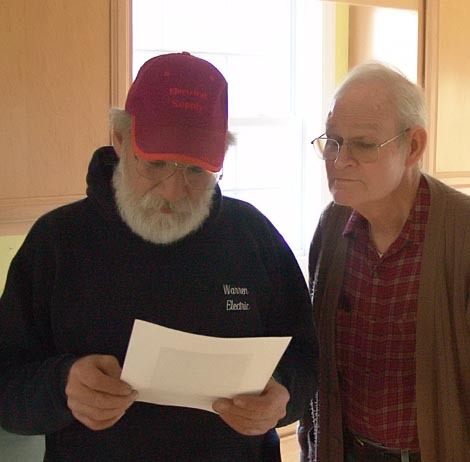 Here Electrical Contractor Ross Warren goes over Tom’s power requirements to make sure that Tom has the right coverage when the generator comes on. A generator cannot carry the load of an entire house, so one has to decide which outlets are essential. Tom’s emergency generator is the right solution for anyone who isn’t able to go out into bad weather and crank up the emergency generator. Usually this involves filling the gas tank several times from a freezing cold gas can that insists on spilling on you. A propane fired generator makes a good deal of sense. An automatic generator makes even more sense. Remember that power outages rarely occur on balmy summer days. They usually happen when the weather is awful. Having a system that comes on even when you are not home gives you additional peace of mind when you live in the country. Not everyone needs an emergency generator, but if you live in an area where most of your neighbors have emergency generators, it’s probably a good idea for you to get one too. Just ask Tom. This entry was posted in Country Living, Possibly Helpful Advice and tagged American Radio Relay League, Emergency generator, frozen pipes, Guardian Standby Generator, power outage, propane, Ross Warren, Tom King, W4VZH. Bookmark the permalink. Actually, the right generator CAN carry the load for an entire house. Our two-year-old Guardian unit, a 16kw, model, has capacity for every circuit in the house. We’re currently only using about 70 percent of its capacity and it ran our house completely for 38 straight hours without a hitch, burning less than a gallon of propane an hour.